From Princess of Monaco and wife to Prince Rainier III, to style and film icon, Grace Kelly is one of the most revered cultural and beautiful icons of our time. Hermes even named a bag after the her- the ‘Kelly’ bag. And it’s not only Hermes that wants to celebrate Miss Kelly - the V&A are holding an exhibit in her honour. Photos by artistes such as Erwin Blumenfeld grace (sorry, I couldn’t resist!) the exhibition, as well as gowns, including her 1955 Academy Awards dress, and the Oscar statue she won for Best Actress for her role in The Country Girl. Kelly was a well respected actress and loved by many, she counted Hitchcock as one of her mentors, and Josephine Baker as one of her best friends, as well as fellow actors Cary Grant and James Stewart. Stewart, after her death, said : You know, I just love Grace Kelly. Not because she was a princess, not because she was an actress, not because she was my friend, but because she was just about the nicest lady I ever met. Grace brought into my life as she brought into yours, a soft, warm light every time I saw her, and every time I saw her was a holiday of its own. No question, I'll miss her, we'll all miss her, God bless you, Princess Grace. She is timeless; so iconic she even appeared on a US stamp 11 years after her death. She remains one of the most beautiful, kind and respected actresses of both her and our time. 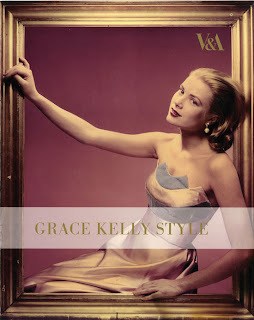 The exhibition Grace Kelly: A Style Icon runs from 17th April – 26th September 2010 at The Victoria & Albert Museum. Tickets are between £4 and £6.